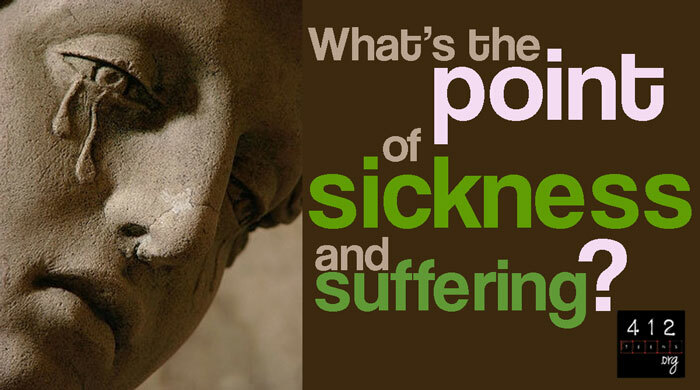 Why does God allow sickness and suffering? It is important when talking about sickness to realize that illnesses were not in God's original design (Genesis 1:27-31). When Adam and Eve used their free will to make the choice to sin in the Garden of Eden, decay was allowed to enter the picture (Genesis 3:14-20). The growth, life, and death of things are reminders that nothing is perfect without God. We have to always remember that God has everything in His hands and that we only see half of the veil (Isaiah 55:9). It is hard to discuss sickness with people because it is a very touchy subject. Sometimes sickness is a result of personal choices such as what we eat or do. Sometimes an illness happens because it is passed down genetically. Sometimes accidents happen that result in sicknesses. It is possible that God will occasionally allow these things to happen in order to bring someone close to Him. It's also possible that Satan and his demons could be causing it (Matthew 17:14-18; Luke 13:10-16). No matter whether it is a natural result of a sinful world, from God, or from the Enemy, we can rest assured that God will use any illnesses to achieve His perfect purposes for our lives. "We also glory in tribulations, knowing that tribulation produces perseverance; and perseverance, character; and character, hope. Now hope does not disappoint, because the love of God has been poured out in our hearts by the Holy Spirit who was given to us" (Romans 5:3-5). Other times, sickness could be allowed as a testament for God's glory (Acts 28:7-10). Remember a guy in the Bible by the name Job? He was a man in the Old Testament who loved his Creator completely and without reservation. God sure allowed for a lot happen to him by Satan's hand—most of it would make us cringe and question God's goodness and righteousness (Job 1:6-12). Satan took and took from Job, down to the man's personal health. Job's friends came and sat with him for a week in silence; they were so shocked at what had happened to him (Job 2:13). Then they questioned him, accused him of having secret sin, and told him to forsake what he believed. Though Job, being human, sometimes questioned why he had even been born, he never cursed God for what was happening (Job 1:22). When all of his friends had abandoned him, Job still found it in himself to trust God. In the end, God praised him and restored twice as much as what he had lost (Job 42:7-17). Be there for them. Encourage them. Comfort them. But remember that it is not necessarily appropriate for you to try to point out the reasons behind their illness. Job's friends were far from helpful with their so-called advice. You could be more damaging than helpful. Loving and caring for them is what we are called to do unless otherwise prompted by God (James 5:15). Don't lose faith in God. You may never know why He is allowing this to happen to you, but you can be assured that there is a purpose (Psalm 119:67-77). God would not allow you to suffer for no reason. God is always good—even when He allows us to feel pain. Death, the ultimate end of suffering, is also an act of God's pure goodness and mercy. I doubt anyone who got to Heaven because of an illness regrets the suffering they had to endure on earth. The growth, life, and death of things are reminders that nothing is perfect without God. Remember that God has everything in His hands and that we only see half of the veil (Isaiah 55:9). Sickness and suffering happen for all kinds of reasons—sometimes through our own mistakes, sometimes through no fault of our own, sometimes because the enemy is determined to make life difficult for us. But God will use any illnesses or suffering to achieve His perfect purposes (Romans 5:3-5). Be comforted by the fact that there is a day coming when sickness will no longer be a problem for anyone (Revelation 21:4). 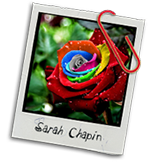 Sarah is involved in student leadership at both a state and national level. A woman with a passion for people and cultures, she enjoys traveling far and wide on adventures with her camera. Her photography is published both online and in print, including in an award-winning arts journal.